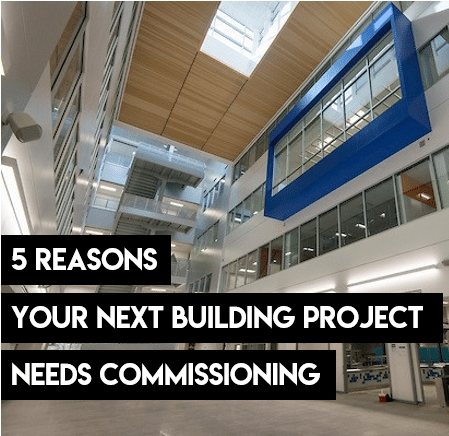 5 Reasons Your Next Building Project Needs Commissioning - Rice & Gardner Consultants, Inc. In case you didn’t know, buildings use a lot of energy – about 40 percent of the world’s greenhouse gas emissions come from building electricity and natural gas use. With environmental concerns at the forefront of most industries today, it would seem imperative that the construction industry find ways to cut this number down significantly. But how do we cut down on energy use while also maintaining occupant comfort? After all, places like our offices and schools are where we spend most of our time. Good news – there’s a way to cut down on energy use, keep tenants happy AND save money: building commissioning. As buildings age, they can fall out of alignment with their optimal, factory-intended performance states. This is where building commissioning comes into play. Essentially, it’s a quality assurance strategy whereby a building owner conducts system reviews throughout a building’s life cycle in order to optimize efficiency, longevity, and performance. By doing so, you can largely avoid any costly repairs or replacements in the future. A Lawrence Berkeley National Laboratory (LBNL) study found that commissioning quickly pays for itself through a variety of savings. Cut up to 30 percent off your energy bill – Commissioning reduces energy usage: when you’re using less energy, you’re paying for less energy. The Lawrence Berkeley National Laboratory study found that over a quarter of the buildings surveyed realized a dramatic 30 percent energy savings from commissioning. On the whole, the 643 US buildings examined saved a median of 16 percent whole-building energy savings for existing buildings and 13 percent for new buildings after commissioning. Commissioning will help your building to be environmentally and wallet friendly. Maintain Occupant Comfort – As mentioned, buildings are made for people to occupy, so naturally, their comfort is of the utmost importance. When systems are not functioning properly, this affects the people inside it. One study found that ‘there is a two percent drop in productivity for each degree above 78°F’ and ‘a similar reduction in productivity occurs when the temperature drops below 72°’ Commissioning prevents these problems by ensuring your system continually meets its intended design — it identifies stuck variable speed drives, inaccurate sensors, and other mishaps that can cause serious problems. Prolong your building’s lifespan – You perform regular maintenance on your car such as oil changes and new tires to ensure you get the most use out of it, why not think of a building in a similar way? Proper commissioning ensures your equipment systems continually operate according to factory requirements. That way, you don’t overload any systems and cause premature failures. Additionally, your building doesn’t start emitting excessive greenhouse gases. Reduce Maintenance Costs – Commissioning is proactive rather than reactive: when you perform regular checks to ensure that systems are up to standards, you can largely avoid having to perform urgent fixes and repairs. A study found that proper building commissioning can lower maintenance costs by 15-35% as it uncovers system inefficiencies or malfunctions early on when fixes are easier, less costly—and on new construction projects—still under warranty. See a Rapid ROI – If you need any further convincing that commissioning is an essential component of a building project, just know that a Lawrence Berkeley National Laboratory report found the typical simple investment payback in commissioning averages 1.8 years, with a range of 0.5 – 3.5 years. In terms of a building’s lifespan, that’s a speedy return to say the least. By hiring an experienced Commissioning Agent to commission or retro-commission your building, you’ll save more in the long run and enjoy a higher performing, environmentally friendly, and more marketable building in the meantime. Contact Rice & Gardner today or visit our building commissioning page to find out more about our expert commissioning services and hear some of our success stories! Our qualified Commissioning Agents are ready to start helping you save money and get your building performing at its optimal level. Previous PostPrevious Katherine Smith Elementary earns LEED Silver!